It is now 2 years on since my initial purchase of this UK income index fund. The concept is fairly simple - to give investors access to a broad range of dividend-paying securities from across the FTSE 350, while reducing the risk of being overly invested in a small number of high-yielding shares or particular industry sectors by limiting the percentage of the index invested in any one company or industry. I have tried holding a portfolio of higher-yielding shares in recent years but felt a little over-exposed to misfortune with my 20 portfolio holdings. If 2 or 3 hit the buffers, my income for the following year could fall by over 10%. The Vanguard fund holds around 120 companies - the top ten holdings include all the usual suspects - Vodafone, Glaxo, BP, BATS, National Grid etc. The effects of the same 2 or 3 shares running into difficulties obviously has far less impact. Ongoing charges are 0.22% and also a one-off dilution levy of 0.40% on purchase. In addition, my broker AJ Bell levy an annual platform charge of 0.25% of the total value of the fund. The current yield is around 4.3% based on projections from last years distribution. Dividends are paid out half yearly in June and December. My initial purchase price was £177.50 - by last March it had fallen back ~9%. However, it has bounced back over the past 12 months and is back to just above my entry price, currently £181 - a total return of ~17% over the past year (incl. income). City of London 20%, Edinburgh 11%, Finsbury Growth & Income 20% and Temple Bar 30%. The fund has so far provided me with income payments of 776.92p in 2015 and 775.65p in 2016 - which gives a current yield of 4.3%. The income distribution represents the combined dividends received from all holdings in the fund (less costs and fund charges) so, unlike investment trusts which hold reserves to smooth out the income payments, I do not know exactly what payment will be received in my ISA until it actually arrives. For example, the income distribution for 2014 was 708.8p and in 2013 699p. 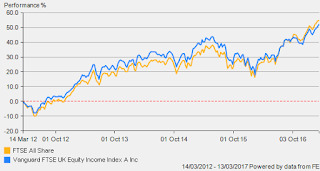 It will be interesting to see how the managed income-focussed investment trusts compare to the Vanguard index fund over the coming year or two. I now use the Vanguard fund as an additional benchmark against which to compare returns for my collectives income portfolio. It’s early days - just two years since purchase but I am happy to continue with this income fund which seems to be doing the job required for my income portfolio. This article is a record of my personal investment thoughts/decisions and is not a recommendation - as always, please DYOR. A low-cost alternative, albeit less diversified, is the iShares Core FTSE100 ETF, charging 0.07%pa and yielding 3.65%. Thanks Pinner. Those charges are very competitive.